There is nothing wrong with Asian exports - 2017 recorded some very strong growth. Admittedly, much of that was off a very weak base in 2016, and 2018 growth rates will look softer. Moreover, the electronics product cycle has helped propel some amazing strength in semiconductor sales, which we see morphing into stronger handset exports through 2018. Again, there is nothing wrong with Asian exports. Asian domestic demand is not bad, but aside from the government supported construction and investment sectors, it could be a lot better. China may be the exception that proves this rule. So we are entirely relaxed to see the USD remaining soft, even as the prospects for the Fed this year seem to be firming around expectations for three more rate hikes. Prospects for a possible US government shutdown by week-end may help keep the USD on the back foot through the rest of the week, though of course, expect a bounce if this situation is resolved. Why is this good news for Asian domestic demand? In short, the USD’s weakness by default translates into relative strength for Asia’s currencies. It also by default tends to keep inflation subdued, as imported goods prices tend to be USD denominated, and therefore cheaper in local Asian currencies. 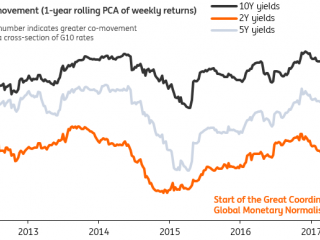 This has meant that despite being a very dollar-centric region, there has been little tightening in the region, despite the Fed’s slow and steady removal of accommodation. And it also means that even with expectations for more from the Fed this year, we expect to see Asian central banks lagging far behind in terms of their own normalisation. This is no bad thing for local domestic demand. Of course, there is another side to the weak USD story, and that is a strong EUR. Yes, both economic giants are looking at very strong growth, and the US has the advantage of the recent tax reform bill to propel growth further in the coming quarters. But investors, rightly in my view, see the prospects for change in ECB policy, as the bigger and more market impactful change. ECB Governor Hanson suggested recently that if growth and inflation did not materially weaken by September this year, that QE in the Eurozone could end then. That sort of comment will kill any suggestion that the ECB will milk QE out as long as possible, with an extremely elongated taper. The dollar’s weakness is also not bad for the world’s energy and other commodity exporters, for whom a weaker USD typically means higher USD commodity prices, and higher local currency receipts. We saw a marked dip in Asian exports following oil’s soft patch in 2015, we think because it hit the terms of trade for the world’s energy exporters, making Asian exports less affordable. A moderate, and stable oil price around USD60-70 is likely to provide a much more stable demand backdrop for Asia’s exporters, even if higher oil prices are usually regarded by short-cut economists as a global tax hike.